EnvisiaCare Services, LLC is a full service lawn and tree company based in Cheyenne Wyoming. We offer the following services to the surrounding region: Tree planting, tree spraying, tree removal, tree trimming, stump removal, lawn fertilization and weed control, landscape installs lawn aeration, lawn mowing/trimming, sprinkler turn-on, sprinkler winterization, and snow plowing and snow removal. Our focus is quality and dependable service. The spruce ips beetle or the spruce engraver beetle has been discovered in Cheyenne, Laramie, and parts of Colorado. Cheyenne Urban Forestry has noted the increase of ips beetle in Cheyenne and issued a statement regarding the ips engraver beetle. The statement covers symptoms of the beetle, how to recognize it, and treatment vs. removal of exposed trees. Download the PDF here or read on to learn more. 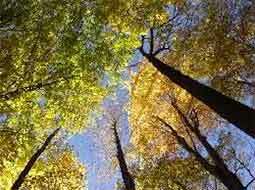 Which Trees Do Spruce Ips Beetle Attack? The most commonly affected trees are spruces like Colorado Blue Spruce, Engelmann Spruce, and Black Hills Spruce. When and How Should My Trees be Treated for IPS Beetle? Two treatments are best for ips beetle, the first during early spring and the second during mid-summer. 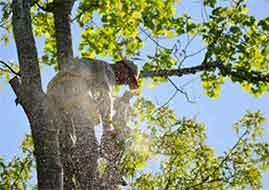 High pressure spray of a preventative insecticide is used to treat the main stem and larger branches of trees. Protect your valuable trees by ensuring your trees are treated with the proper insecticide, by trained applicators, and with the right equipment. If there is evidence that your tree has ips beetle, call us to inspect and confirm its presence. Generally a tree that is infested is not worth treating and is a better candidate for removal. Contact us for free consulting on ips beetle presence! By feeding the root system with the proper nutrients, the soil composition more closely resembles its natural blend in the forest. Often times with home construction, landscaping, or compaction, the soil is changed for the worse. With the deep feeding probe the soil is enriched with nitrogen, phosphate, copper, potash, iron, and other essential minerals. The ground around the tree is also aerated and water is provided to the root zone. The fertilizer is a slow-release formula and feeds your trees for the better part of a year. For that same reason most anytime of the year is a good time to feed roots. Which Trees Need Deep Root Feeding? Most all coniferous and deciduous trees benefit greatly from annual deep root feeding. Larger bushes are also good candidates for deep root feeding. Urban trees and plants often live with less than ideal root conditions. Deep root feedings help to counteract the negative effects of urban living. Larger and developed trees may not need additional fertilization, or if more growth is not desired from a particular tree. Read up on well known insect problems that your trees and bushes may encounter, or download and check out the Tree Owner's Manual that the Forestry Division published in order to help you learn more about your trees. 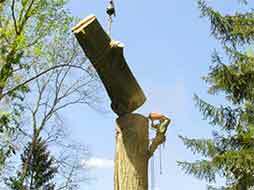 We take pride in providing quality tree removal services in Cheyenne. Do you need a pine tree removed due to the ips engraver beetle or mountain pine beetle? Was a tree planted (or volunteered) in the wrong place and is now a nuisance, or even threatening to fall on your house? Did a heavy snow or a strong wind cause a branch to break off of your tree? Are low or wide hanging branches impeding traffic, violating Cheyenne city code, or posing a traffic hazard? Do you need help with tree stump removal? If one of these scenarios applies to you, we can help! There are many reasons a tree may need to be removed or trimmed. Whether it's big or small we are the local Cheyenne tree service company to call. We have the tools and experience to trim and remove trees safely and in a timely manner. We also offer emergency tree removal when it just can't wait! In addition to tree removal we also offer tree pruning and shaping to help keep your trees looking beautiful year after year. * If you would like to keep the firewood, we are happy to cut it to length at no additional charge. We also provide lawn fertilization in Cheyenne Wyoming. Our slow release fertilizer will keep your grass looking green and healthy throughout the season. It gives the turf the proper nutrients to stay healthy and our weed control system will ensure your lawn isn't over run with invasive weeds. We offer 5 applications throughout the season in order to maintain optimal grass health and weed control. Your search for a Cheyenne lawn fertilizer company ends here. We begin treating for weeds in the very early spring with pre-emergent, attacking weed seeds before they have a chance to germinate. Our applicators use tried and true pesticides and practices to keeps the weeds away. We treat commercial, industrial, and residential sites. In a dry climate like Cheyenne's, aeration can make a big difference when it comes to getting the water and nutrients down to the roots of your lawn. The most common times for lawn aeration is in the spring and fall, thus allowing the grass to benefit more from the natural moisture of the season. This is generally a time when irrigation systems are unavailable, making the impact of natural precipitation that much more important. We offer weekly and bi-monthly (every other week) lawn mowing services in Cheyenne Wyoming. This includes cutting the grass, trimming the edges and obstacles of the lawn, and blowing off all hard surfaces. Longer grass fairs better in the heat of the summer and requires less water to thrive. Our general cutting height is 3", but that can be adjusted upward or downward depending on personal preference and the time of season. Mulching the grass returns organic nutrients to the soil and provides for a healthier and fuller turf. This is our preference and philosophy for optimum lawn quality. The cut grass can also be caught and removed from site depending on owner preference. We welcome new customers up to the end of April, at which time our mowing schedule is set for the season. If you miss this window feel free to sign up for next year. We do not perform any one-time mowing services, sorry for any inconvenience. After the growing season (but before the snow flies) is when sprinkler system winterization takes place. We have the right equipment and know-how to protect your irrigation system. The back-flow valve, sprinkler lines, and valves will be winterized in order to prevent any freezing and breaking during the winter months. Have this performed by a professional in order to avoid costly repairs and headaches next spring! When it comes to snow removal it's all about having the right people, the right equipment for the job, and plenty of experience. Whether it's commercial plowing or residential snow removal we have you covered. Our crews provide snow plowing, sanding, salting, and deicing services. We are prepared 24/7 for snow accumulation so that you can rest easy while it snows and blows outside. Businesses and commercial properties are completed before businesses open, or by any time specified by the owner. Residential properties are to be completed by 8 a.m., unless otherwise specified. Generally we remove snow at our client's properties when two or more inches of snow accumulates, unless otherwise specified by client.